The Recommended Practice 1210 was defined by the Technology and Maintenance Council (TMC) as a standardized API for communication between Windows® applications and communication networks in vehicles. The PCAN-RP1210 API by PEAK-System is an implementation of the RP1210 versions A and C with support for CAN and SAE J1939 networks. Thus, the API makes it possible to develop own RP1210 applications and to use already existing ones with CAN interfaces by PEAK-System. With the PCAN-RP1210 API you get a single user license for the development package and for the RP1210 connectivity to PEAK CAN interfaces. 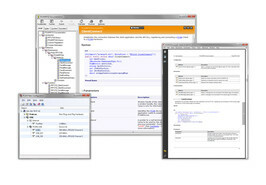 The PCAN-Developer RP1210 Extension contains a distribution license for the PCAN-RP1210 API DLLs. With this extension, your customers can install the DLLs via the PCAN-Developer redistributable package. Note: The PCAN-Developer RP1210 Extension is only available in conjunction with a valid PCAN-Developer license.